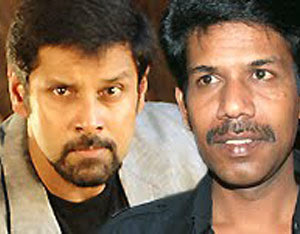 Home » Latest Buzz » Chiyaan Vikram Wih Bala Again! Chiyaan Vikram Wih Bala Again! Veteran filmmaker Bala, who is busy in the shooting of his forthcoming flick ‘Avan Ivan’, has decided to do his next venture with Vikram. He also promised Chiyaan that he will finish the film in eight months duration. For this new project, Bala has already roped two of his assistants to prepare the first draft of the script that suits Vikram well. He gave them some ideas and asked them to finish it before he completes the shooting of Avan Ivan. Sources say that Vikram was also very much happy to work with Bala again after ‘Pithamagan’ and he will take up this project once he finishes with Boopathy Pandian.